Tel Aviv Police are also searching for the murderer of another teenage girl who had been missing since last Wednesday. Police are looking for a suspect in the murder of a Silvana Tsegai, 12-year-old Eritrean native in Tel Aviv Monday night. The girl's badly battered body was discovered by her mother in their apartment in the Hatikva neighborhood, police said. Both the mother and daughter were migrants seeking asylum from Eritrea. The main suspect is the mother's ex-boyfriend, also from Eritrea. KAN radio reported that the suspect's father described him as "crazy." 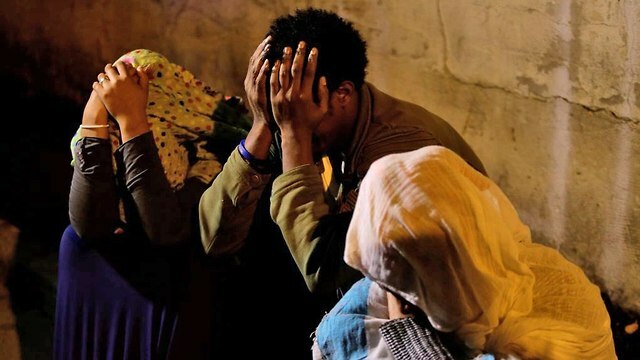 "When we turn to the Israel Police for help, our request often remains unanswered," the Eritrean Women's Community Center for Eritrean asylum seekers in Israel said in a statement. Speaking to the Israeli government, the group said "our blood has been abandoned and we are in the line of fire. Please listen to our cry and help us!" The Eritrean women's group pleaded with the Israeli government to change its policies and allow these women to appeal through welfare authorities. Another murder of a minor was reported Monday, when forensic teams positively identified a body found in the northern village of Jish as belonging to Yara Ayoub, 16, who had been missing since last Wednesday. Police said a man arrested in connection with the disappearance of the teenager is suspected in her murder, as a second suspect was also arrested in connection with the crime. "We can no longer bear the terrible news that just keeps coming. After the body of a 16-year-old girl was found in the north, now we've learned about the death of a teenager in Tel Aviv, whose body was found with signs of violence," said the Israel Women’s Network. "This is an emergency that cannot be ignored. It's time for the government to join the war for the lives of women in Israel."